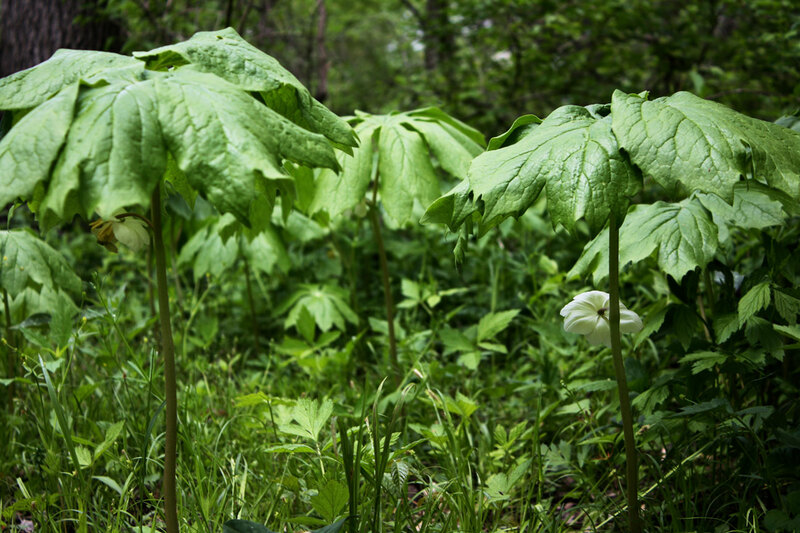 Looking like so many foot-tall green umbrellas, mayapple colonies are found throughout the Ozarks in April. 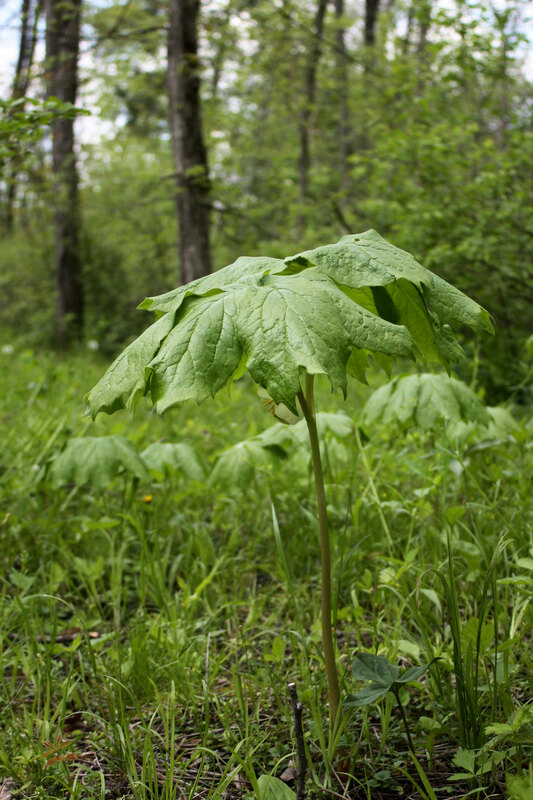 A forest understory plant, Podophyllum peltatum spreads primarily by an underground tuber system. 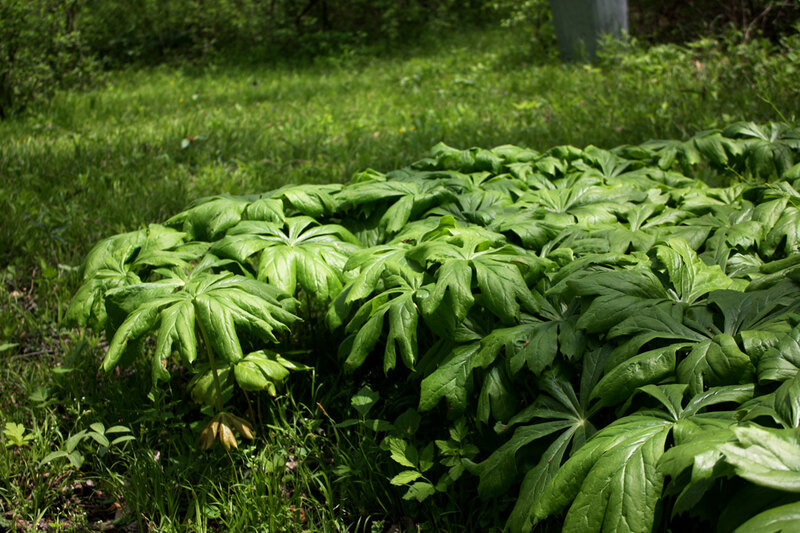 The most striking part of the mayapple, however, is rarely seen. 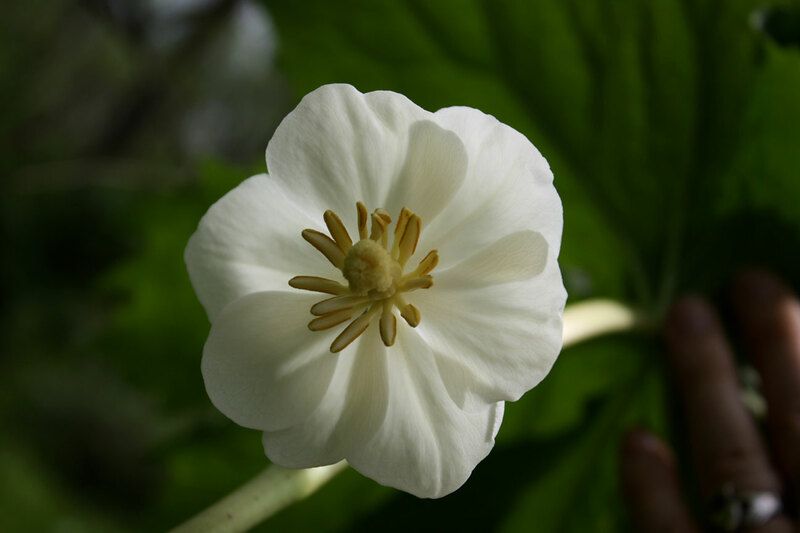 Borne on a single, succulent stalk beneath the umbrella is a beautiful white flower which develops to an “apple” late in the summer. 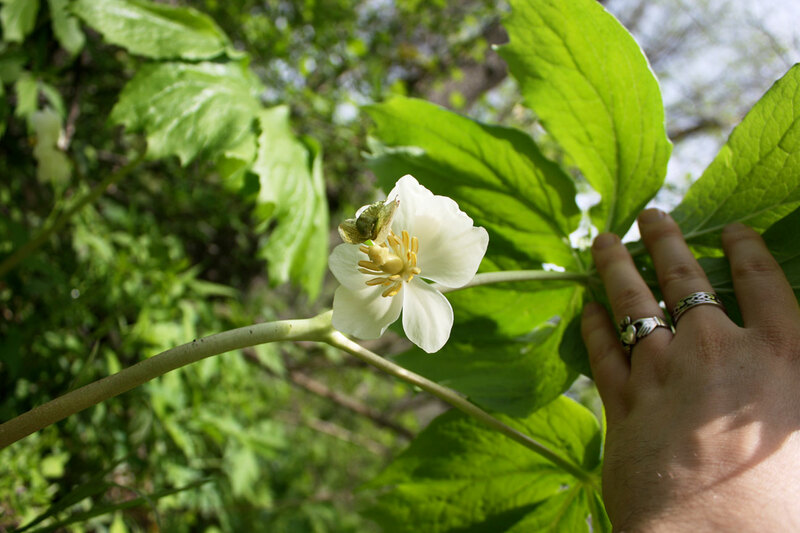 Both the fruit and the tuberous white roots of this plant are associated with Ozarks folklore and Indian medicine. SIZE: 6-20 inches tall; flower 1-2 inches wide. 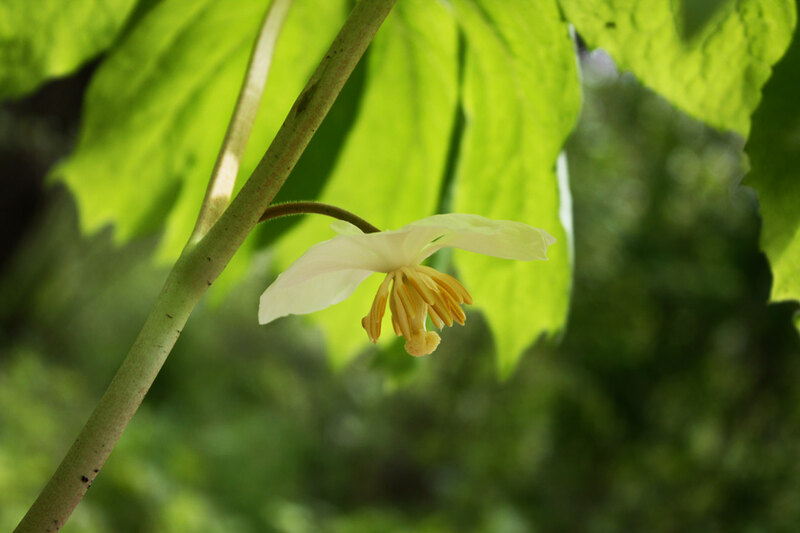 WHAT TO LOOK FOR: flowers cup shaped, showy, borne singly between 2 large leaves; fruits lemon-yellow when ripe, as plants die back. 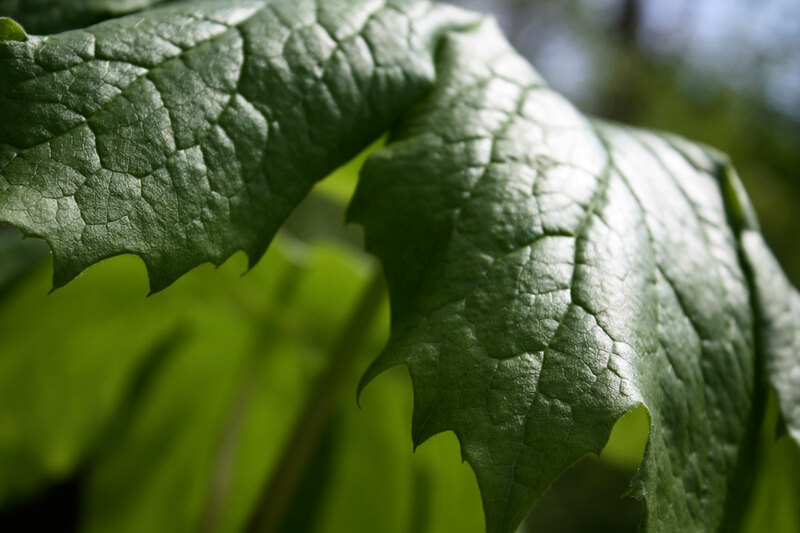 HABITAT: rich woods, clearings. IN BLOOM: April through June. — page 350, Wernett, Susan J., et al. North American Wildlife. The Reader’s Digest Association, Inc., 1986. May Apple. It was used as a laxative made by boiling a very strong tea sweetened with sorghum molasses. — PAGE 6, ALLEN, CHICK WITH EVELYN FULLERTON, OZARK ROOT DIGGER, MAY 1974. MAY APPLE. WILD LEMON. RACOON BERRY. 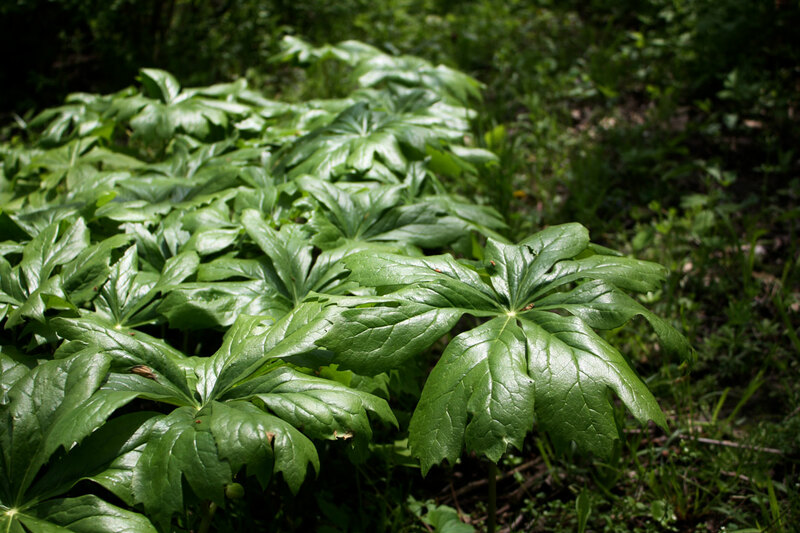 WILD MANDRAKE. Bark: Deobstruent. Cathartic. Alterative. Anthelmintic. Hydragogue. Sialogogue. Antibilious. Diuretic. Narcotic. Valuable in jaundice, bilious and intermittent fevers, scrofula, syphilis, liver complaints, rheumatism, and where a powerful cathartic is needed. 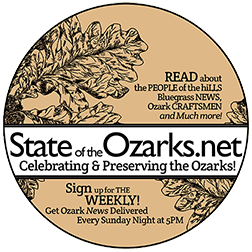 A WORD OF SAFETY: folk remedies on StateoftheOzarks are published for informational purposes only. 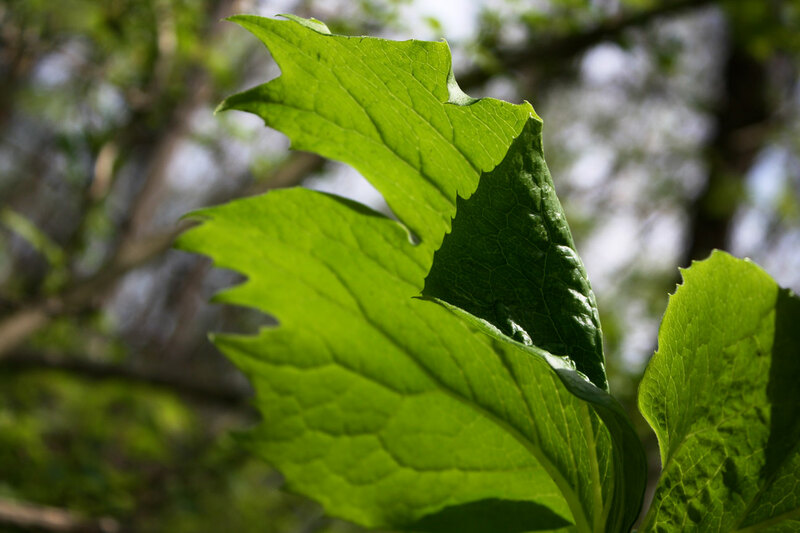 These remedies are never intended to cure, treat or mitigate any disease or disease condition. For questions about disease or disease conditions, consult a qualified healthcare professional.